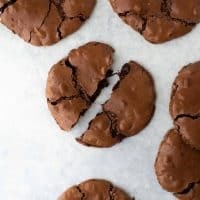 Flourless Chocolate Cookies! Easy, naturally gluten-free and so decadent! Rich and fudgy chocolate cookies with a crackly top and soft center. Add marshmallows and walnuts to make these Rocky Road Cookies! Bring these cookies to your next party or bake sale! They are EASY to make but seem fancy. These cookies are always a crowd-pleaser and perfect for a gluten-free option! If you love rich, decadent chocolate desserts like flourless chocolate cake – these cookies are for you! They are soft and fudgy with the perfect amount of chew. These were some of the first cookies I ever made when I was diagnosed with celiac disease back in 2012. Back then I figured anything “flourless” would be naturally gluten-free. I also thought I couldn’t go wrong translating something as delicious as flourless chocolate cake to a cookie. And I was right! Flourless cookies! How can it be? Flourless cookies often rely on nut butter for structure and texture. However, these cookies get their distinctive crackly top (almost like a brownie!) and gooey center from a base of egg whites and powdered sugar. These cookies are super easy to make with just 6 pantry-staple ingredients! STEP ONE – Mix the powdered sugar, cocoa powder and salt together in a bowl. Whisk everything together until incorporated. STEP TWO – Add the egg whites and vanilla. You’ll want to start with 2 egg whites and add more if needed after mixing. STEP 3 – See the consistency in this photo? It’s not quite right – a little too thick. Adding one more egg white should do the trick! You want the dough to resemble thick brownie batter. STEP 4 – This looks like the right consistency! Now you’ll fold in the chocolate chips. After that let the batter rest for 15 minutes. STEP 5 – Scoop the dough out onto parchment-lined baking sheets. I like to lightly spray the parchment with a little cooking spray before baking so the cookies don’t stick. Then bake the cookies at 350F for 12-14 minutes. STEP 6 – One of my favorite ways to make these cookies is to do a Rocky Road version! Add some marshmallows and walnuts to the dough. The marshmallows get all toasted and melty and the crunch of the walnuts is just perfect. Try it! TIP: Add marshmallows and walnuts to take these cookies to the next level! See what I mean? That toasted marshmallow is delicious! Either version is delicious – but I prefer the Rocky Road! These naturally gluten-free cookies seem like they’re made in a fancy bakery, but they’re secretly so easy to make. I love bringing them to bake sales for this reason! – Spray the parchment: Lightly greasing the parchment will help these cookies come off the pan easily. – Start with 2 egg whites: Start with 2 and add more eggs whites if needed to get the desired thickness. You should have the consistency of brownie batter! – Let the batter rest for 15 minutes: This will help the cookies have the perfect texture! – Add mix-ins: Chocolate chips, marshmallows and walnuts really take these cookies to the next level! Flourless Peanut Butter Chocolate Chip Cookies – The easiest peanut butter cookies you’ll ever make! Only 5 ingredients needed. 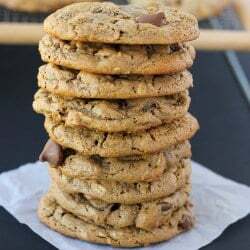 Peanut Butter Monster Cookies – These cookies use ground up oats instead of flour. Add your favorite mix-ins like mini PB cups or M&Ms! Chocolate Coconut Cloud Cookies – Easy to make with egg whites, coconut, and sugar. Smothered in melted chocolate and sprinkled with macadamia nuts! Easy, naturally gluten-free and so decadent! Rich and fudgy chocolate cookies with a crackly top and soft center. Add marshmallows and walnuts to make these Rocky Road Cookies! Preheat oven to 350 degrees F. Line two rimmed baking sheets with parchment paper. Spray the parchment paper lightly with cooking spray. In a large bowl, whisk together the powdered sugar, cocoa powder, and salt. Beat in two egg whites and the vanilla extract until the batter is moistened. You’re looking for a brownie-like, thick and fudgy batter consistency. If it seems too thick, add another egg white – then a 4th one if it still seems too thick. Fold in chocolate chips. Let the batter rest for 15 minutes. Spoon batter onto the prepared baking sheets in 12 evenly spaced mounds per cookie sheet. Bake for 12-14 minutes, until the tops are glossy and lightly cracked. Slide the parchment paper (with the cookies) onto wire racks. Cool completely. Enjoy! 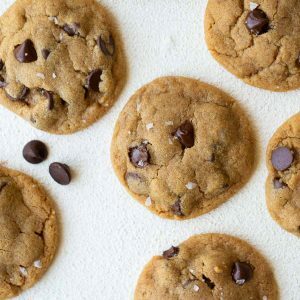 Make it DAIRY-FREE: Use dairy-free chocolate chips like Enjoy Life Foods to keep these cookies dairy-free. The 15 minute rest helps these cookies have the perfect texture and consistency. These look delicious! I'm definitely going to make them! no flour and these look sooo good?! that's awesome! Definitely going to have to make these. I've never tried flourless cookies before! Can you use the whole egg or will that change the texture too much? can you use the whole egg instead of egg whites? These look incredible, I’m really keen to try them. I made these today. Something somewhere went wrong and the batter was a little liquidy. I made it into one whole cookie, seeing what would happen. It wasn’t pretty. But let me tell you – it was delicious!!! We could have snacked on that whole thing in one night if I hadn’t of hid it. These are fabulous! I added a little peppermint extract to make them festive. They turned out great! Made by hand (couldn’t be bothered to get the mixer out), and used 4 whole eggs to get the right texture. Natural, not dutch process cocoa, and I used 2 cups of chocolate chips. Also added in a cup of chopped pecans. DELICIOUS. Crisp, fudge-y, chewy. NOMNOM. if I can’t have eggs, what else can I use instead? Amazing Cookies! They’re A-#1! A friend baked them for a gathering and they were a huge hit! Fudgy, moist – and super-chocolately: Yum-Yum! That is great to hear! Glad you enjoyed them! Super Chocolate-ly, Super Moist and Super Yum! A-#1! I just made these and they were kind of hollowish, there wasnt much cookie there. The dough was more like a batter, maybe I used too many egg whites? They’re good, just not fluffy or cookie like. Yes – I would try using 1 less egg white next time. When I’ve made these, they are more fudgey like a brownie than fluffy like a cookie. Sorry they weren’t what you were expecting! I’ll try that next time, I’ll definitely make them again. Dont be sorry, it’s trial and error! I’ll let you know how it works next time! I used 3 whole eggs and added chopped nuts. Perfect. Cooked in convection oven tor 12 minutes. Perfect for a cookie exchange today. Great recipe! I’d love to make these. Do you have any recommendations for adjusting the recipe to make it sugar free? I usually don’t leave comments but I had to tell you that these cookies are everything good in this world. OMG! OMG! OMG! Save me….nomnomnom! I made a few of these today. I have never tried a gluten free cookie or a flourless cookie. I really liked the cocoa flavoring. I disliked the powdered sugar, to me it was very over powering. Granted, I was using my mom’s powdered sugar so I really had no idea how old it was lol. I think I will experiment with these, and maybe use less powdered sugar and add some regular sugar? Either way, I hope to fit these to my liking as they satisfied my chocolate craving very quickly! Thanks! Wow these were good. Like used 3 whole eggs, and put in white choc chips because that’s all I had. They’re super sweet but I find most gluten free treats sweeter than usual. Loved these will try again with walnuts and dark choc chips and less sugar. I made these today – flavor was great, however they came out hollow around the edges, only a small bit in the middle was actually chewy. I used just shy of 4 egg whites, so initially I thought it was too wet, but they really didn’t spread out at all, so maybe it was too dry. Who knows! I’ll have to play with it some more. I made these today and they taste good. The main issue I have is after chewing for a while, I end up with a mouthful of chocolate water and hard little bits that do not dissolve (I guess from the edges of the cookie?). Is this supposed to happen? I just made these for the first time. After three egg whites, the consistency was still too thick. When I added the fourth, it was a little runnier than I expected. I cooked the first batch anyway, and they came out fine. But I was still looking for a slightly different texture, so I added the equivalent of what would be (for the entire recipe) 1 cup of almond meal. The taste and texture with this modification are exactly what I was aiming for – rich and chewy! Incidentally, I cooked them for 12 minutes with a Silpat on my cookie sheet. I miss eating good cookies since I found out about my gluten allergy. However, I don’t miss anything with these cookies! I added a cup of walnuts and they were divine…crunchy on the outside and chewy on the inside. Perfect! Thank you for such a delicious recipe! I bought a flourless chewy cookie at Starbucks the other day for my sons to share, and they loved it. I looked it up online, and your recipe showed up in the search results. They looked exactly the same as Starbucks’s flourless chewy cookie and the ingredients were the same, so I tried baking up your version. They were just as big a hit as the Starbucks one even though I had to make them without the chocolate chips because I didn’t have any. My sons kept saying, “Yum! They taste just like the one from Starbucks!” So tasty and MUCH LESS EXPENSIVE! 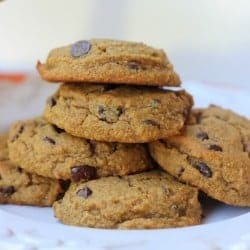 As a gluten-free family, we have eaten A LOT of GF cookies, and these rank as one of the best! After adding two egg whites, I thought it was a little thick so I added a third. The dough quickly became batter (almost like cake batter) and I had to add more powdered sugar and cocoa to try to thicken it enough to drop them by the spoonful. They still tasted great but were pretty hollow and not the best consistency. Next time I’ll definitely only use 2 egg whites. If I hadn’t added a third, I’m sure they would have been perfect! These cookies are fantastic. I added a little mandarin orange zest, and they were outstanding! Thanks for the recipe! I am pleasantly surprised at how easy and good these cookies are. I used the whites of two medium eggs and the cookies turned out brilliant. They were chewy and fudgy on the inside. These cookes are SO good!!! The fudge/brownie flavor is amazing! I will definitely be ,making these again! I’m glad they turned out for you! How long will these cookies keep? I want to use this recipe for wedding favours for my gluten free guests. I’m not 100% sure (these don’t last long at my house! ), but I think they will be good for up to 2 days. Good luck!